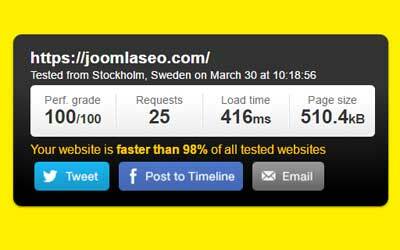 Yes, with a little bit of work you can achieve performance scores of 100% in tools like Pingdom Tools, GT-Metrix or Pagespeed. The result to the left is actually this site, feel free to verify the test here. Of course it all starts with ultrafast hosting (I recommend Siteground), but there are many actions you can take, from simply switching on the options in Joomla to advanced tweaking of your server and .htaccess files, but there are also very nice extensions that can greatly enhance performance, making your site ultrafast. Before optimizing, make sure you test your current website performance with a tool like GT-Metrix. Many sites are slow because they use too many frontend extensions like sliders and galleries.